The painfully slow rollout of the 2015 Acura NSX continues as Honda spilled some more details about what's actually going to power the car when it eventually goes on sale. Hint: it's turbocharged. Up until now, Honda has only confirmed the NSX would get a mid-mounted direct-injected V6 with its hybrid all-wheel drive system. And they've toured the planet with a string of NSX-related concepts that are, well, still concepts. But yesterday at the Tokyo Motor Show, Honda announced it was adding two turbos to the V6 that will power the NSX, as the company has joined the growing club of firms on a turbo kick. 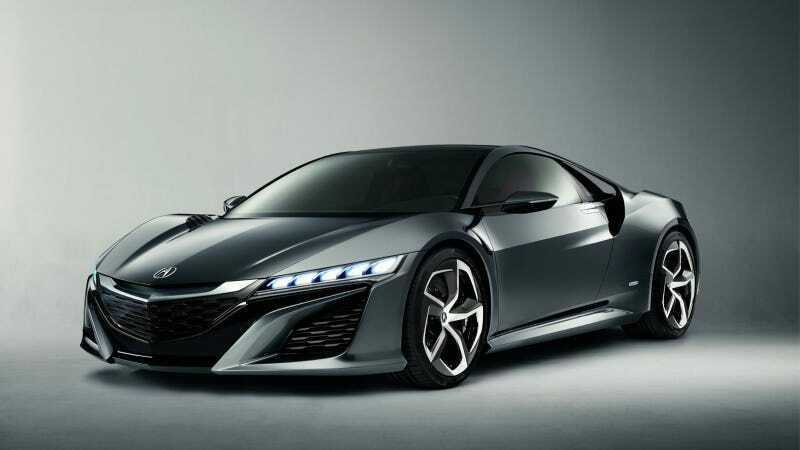 What's more, as Edmunds reported, the configuration in the NSX isn't going to be shared with any other Honda product. That means the size of the V6, however, is up for debate, according to Automotive News, even though it was pretty much assumed it would share a basic recipe with the RLX SH-AWD Hybrid that goes on sale next year. With its 3.5-liter unit and two electric motors, the big sedan puts out a combined figure of 377 horses. Throw in another motor and two turbos and something around 500 horsepower sounds comfortable. This mystery twin-turbo V6 is also teaming up with a previously confirmed dual-clutch transmission of the paddle variety with an unconfirmed amount of gears. Automotive News also reported that Honda is mulling an 8-speed dual-clutch transmission that tops the 7-speed unit going into the RLX Hybrid. It's all sounding good, but there's been no change in the timetable. So expect another round of concepts and detail drips before the car goes on sale in 2015.